The survey demonstrates that undergraduate SIUE students, who choose to borrow, carry a low amount of student debt ($22,277 average) at graduation and well below the average for a college student in Illinois ($29,589). 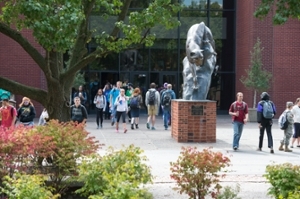 More than 42 percent of SIUE students graduate with zero student debt. According to Payscale.com data for 2016, the starting salary for the average SIUE graduate was $48,100. LendEDU is the first organization to aggregate and analyze this data for the Class of 2016. See the rankings at Student Loan Debt Rankings - School Level or at the state level at Student Loan Debt By State By School. LendEDU’s Student Loan Debt By School By State Report was created using the latest licensed Peterson’s financial aid data. Peterson’s released the fresh data for the Class of 2016 in September 2017.